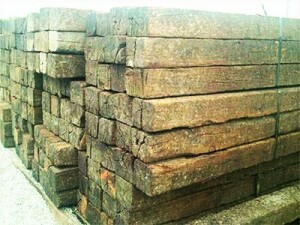 Looking for railroad ties for your next outdoor project? Look no further than J&N Feed and Seed. We’ve got # 1-grade railroad ties in-stock. Railroad ties lend a raw, natural beauty to any landscaping project. Ties can be used as functional elements or for decorative accents. Construct beautiful fences, corrals, chutes, steps, retaining walls, flower boxes, borders and walkways with ties. Use ties for construction applications instead of brick, cinder block or synthetic materials. Ties can also be used in combination with other materials to create a variety of attractive textures and designs. # 1-grade rail road ties are the best-used ties you can buy, with three good, solid sides and moderate imperfection. Come see us for all your landscaping needs. This entry was posted on Tuesday, April 17th, 2018 at 1:54 pm	and is filed under Garden, News & Updates. You can follow any responses to this entry through the RSS 2.0 feed. Both comments and pings are currently closed.